Defense rules the day and freshman Clark nets 11. 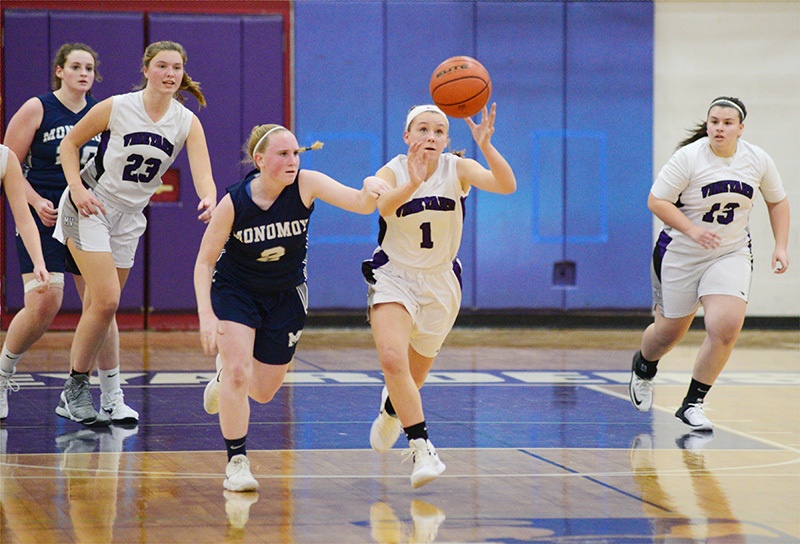 The MVRHS girls basketball team started off the new season with a defensive gem in a 32-21 Cape and Islands League win over the Monomoy Sharks, Tuesday afternoon at the Sancy Pachico Gym in Oak Bluffs. “We focused on defense during practice, and it paid off,” Vineyard Coach Sterling Bishop said after the win. The Vineyarders scored the first seven points, and used a suffocating defense to hold the Sharks to just one basket through the first eight minutes. 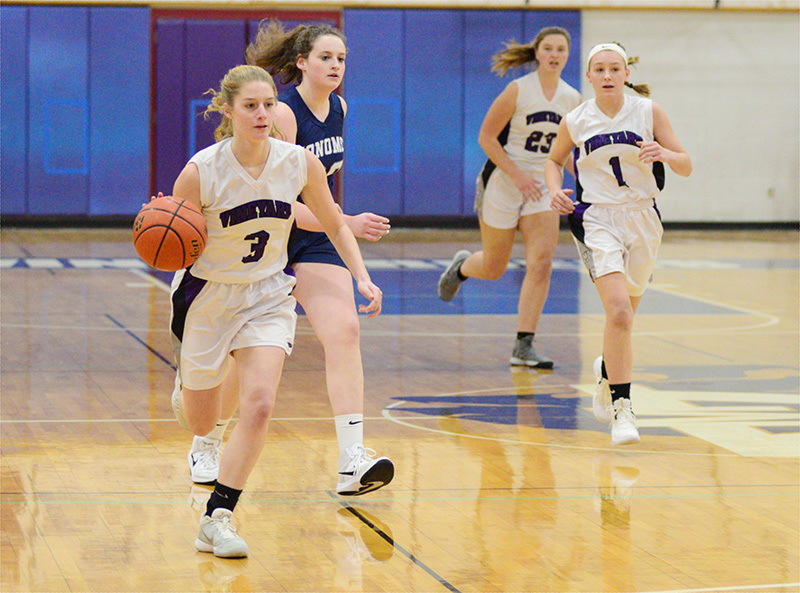 Taylor Hughes scored the first Vineyard bucket of the season, freshman starter Braedyn Clark drained a three-pointer, and Sasha Lakis scored on a put-back. 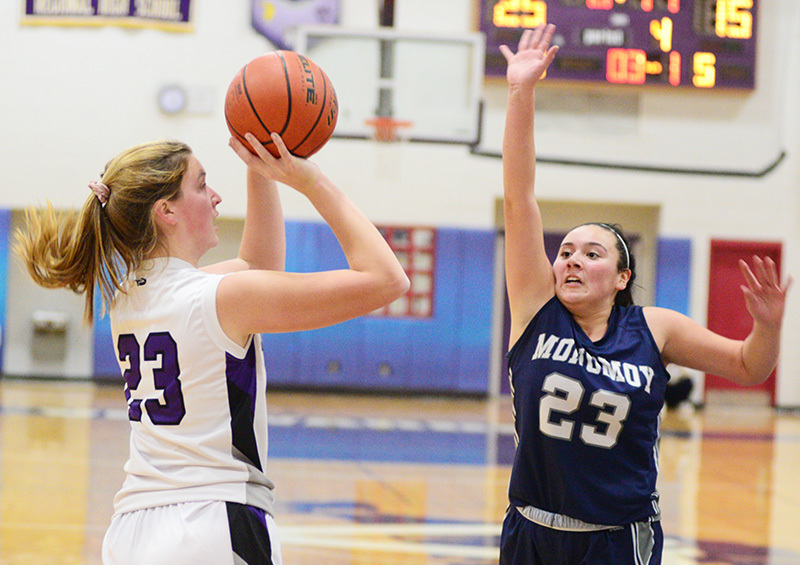 In the second quarter, Monomoy turned the tables on the hosts. The Sharks did a better job of penetrating the paint, and put in a clutch of second-chance baskets, outscoring MV 9-2 to lead 11-9 at halftime. After the break, the Vineyarders cranked up their defensive intensity to a new level and took control of the game with a 14-0 run to start the third quarter. Kylie Estrella and Braedyn Clark both hit treys, and Sasha Lakis added four points from the low post. The Sharks lost their bite inside, and started throwing up prayers from the perimeter. 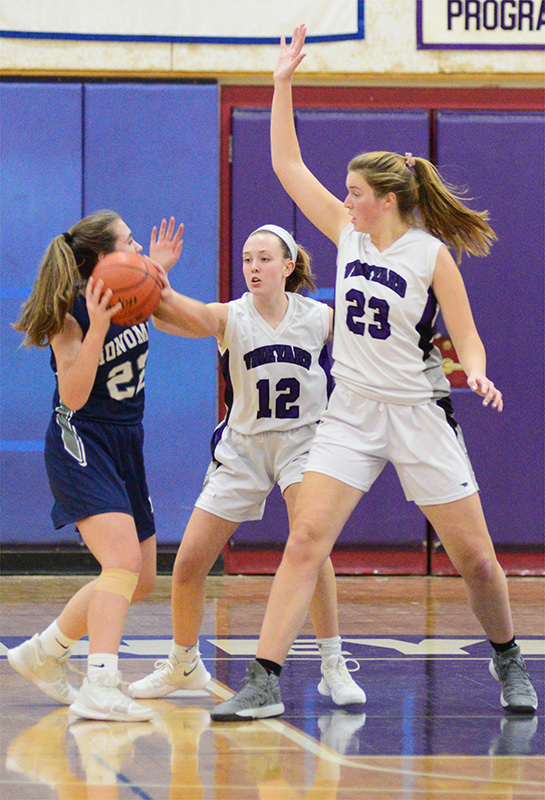 Following a timeout, the Sharks cooled off the Vineyard spurt with a full-court press, and sank a pair of baskets to trail 23-15 after three quarters. The final period was a stalemate, with the Vineyarders muscling out a 9-6 advantage to seal up the win. Braedyn Clark led all scorers with 11 points and added seven steals. Sasha Lakis scored eight points, grabbed 10 rebounds, and blocked four shots. Kylie Estrella finished with nine points, a pair of steals and a block. Taylor Hughes and Evanna Quinn chipped in two points apiece. Prior to the varsity contest, the Vineyard JVs lost to the Sharks, 32-18. 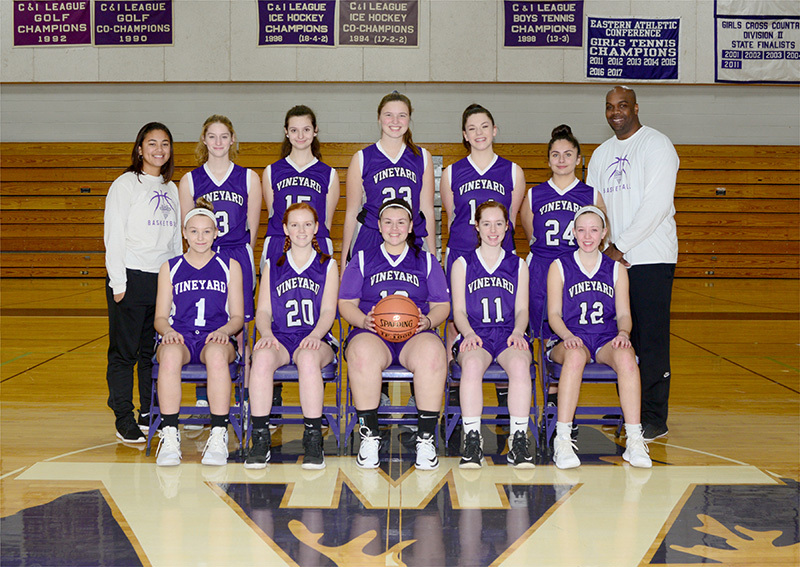 Leah Hairston scored five points for MV, Michaela Benefit and Ella Oskan each had four, and Bella Thorpe chipped in three. Summer Cardoza, back after a one-year absence, is the lone senior on the squad, and will captain the Vineyarders along with junior Katherine O’ Brien. 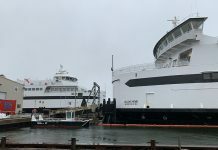 After nine seasons in the Eastern Athletic Conference, the Vineyarders, who posted a 9-11 overall mark last year, have moved to the Cape and Islands League for 2018–19 to compete against Cape Cod Academy, Cape Tech, Falmouth Academy, Monomoy, Nantucket, St. John Paul II, Sturgis East, and Sturgis West. In the coaching staff, Kendall Robinson has moved up from the JV team to be varsity assistant coach this season. Jillian Sedlier is the new JV head coach while Alyssa Lemoi, at the JV helm for the past three seasons, is now the assistant coach.